สำหรับภาพยนตร์เรื่อง ยัยตัวร้ายกับนายซูเปอร์แมน เธอรับบทเป็นนักข่าวทำสารคดีเกี่ยวกับมนุษย์ จนพบกับชายผู้หนึ่งที่อ้างตนเป็นซูเปอร์แมนคอยช่วยเหลือคนอื่น ช็อนค่อนข้างกดดัน เพราะต้องมาแสดงคู่กับ ฮวัง จ็อง-มิน นักแสดงที่มีชื่อเสียง เธอกล่าวว่า "แม้กระนั้นก็มีความโชคดีเข้ามาฉันคิดว่ามันเป็นโชคชะตาที่ทำให้นักแสดงพบกับงานใหม่ ในวันแรกที่ฉันพบเขาฉันพบว่ามีหลายอย่างที่ต้องเรียนรู้จากเขาไม่เพียงแต่การแสดงของเขาแต่เป็นที่การวางตัวด้วย"
↑ "เกาหลีฟีเวอร์". ASTV ผู้จัดการรายวัน. 21 ธันวาคม พ.ศ. 2547. สืบค้นเมื่อ 6 ตุลาคม 2557. ↑ "เมื่อยัยตัวร้าย'จวน จีฮุน'กระโดดลงจอแก้ว". คมชัดลึก. 1 กุมภาพันธ์ พ.ศ. 2557. สืบค้นเมื่อ 5 ตุลาคม 2557. ↑ "ยัยตัวร้าย "จอนจีฮุน" 32 สุดแจ๋ว! โกยรายได้เฉพาะโฆษณา รวยเละคนเดียว 640 ล้านบาท!". มติชน. 26 กรกฎาคม พ.ศ. 2557. สืบค้นเมื่อ 5 ตุลาคม 2557. ↑ Wang, Ping (23 January 2006). "New image for sassy Girl". CCTV International. สืบค้นเมื่อ 2012-11-18. ↑ 5.0 5.1 5.2 5.3 5.4 5.5 Paquet, Darcy. "Actors and Actresses of Korean Cinema: Jeon Ji-hyun". Koreanfilm.org. สืบค้นเมื่อ 2012-04-18. ↑ Yeo, Shi-dong (24 November 2002). "My Bizarre Girlfriend Gets Highest Model Contract Ever". The Chosun Ilbo. สืบค้นเมื่อ 2012-11-18. ↑ Jeong, Hyeon-seok (10 February 2004). "One Interview After the Other for Jeon Ji-hyun". The Chosun Ilbo. สืบค้นเมื่อ 2012-11-18. ↑ "Top Korean Female Star Makes Waves in the Chinese Mobile Market". The Chosun Ilbo. 7 May 2004. สืบค้นเมื่อ 2012-11-18. ↑ "A Tale of Two Jeons". The Chosun Ilbo. 1 April 2004. สืบค้นเมื่อ 2012-11-18. ↑ Hong Joo-hyun, Wohn Dong-hee (20 January 2005). "Beauty brands seek Korean faces". Korea JoongAng Daily. สืบค้นเมื่อ 2012-11-18. ↑ Shim, Seo-hyun (10 December 2011). "Jun Ji-hyun replaced as Elastine's go-to girl". Korea JoongAng Daily. สืบค้นเมื่อ 2012-11-18. ↑ "Jeon Ji-hyun Cedes Advertising Power to Jang Dong-gun". The Chosun Ilbo. 30 March 2007. สืบค้นเมื่อ 2012-11-18. ↑ "When Stars Bank on Advertising Only". The Chosun Ilbo. 5 September 2009. สืบค้นเมื่อ 2012-11-18. ↑ "Windstruck to Premiere in Hong Kong". The Chosun Ilbo. 28 May 2004. สืบค้นเมื่อ 2012-11-18. ↑ Walsh, Bryan (31 May 2004). "A Force to Reckon With". Time. สืบค้นเมื่อ 2012-11-18. ↑ "Jang Dong-gun Voted Korea's Most Bankable Star". The Chosun Ilbo. 20 October 2005. สืบค้นเมื่อ 2012-11-18. ↑ "Jeon Ji-hyun Vehicle Aims Straight for the Tear Ducts". The Chosun Ilbo. 19 March 2006. สืบค้นเมื่อ 2012-11-18. ↑ "Jeon Ji-hyun Looks to Confound Critics in Vampire Film". The Chosun Ilbo. 18 May 2009. สืบค้นเมื่อ 2012-11-18. ↑ "Korean Stars Make Beeline for Hollywood". The Chosun Ilbo. 9 July 2009. สืบค้นเมื่อ 2012-11-18. ↑ "Jun hypes vampire movie". Korea JoongAng Daily. 5 June 2009. สืบค้นเมื่อ 2012-11-18. ↑ Yoon, Susan (24 September 2009). "Taking a shot at Hollywood". Korea JoongAng Daily. สืบค้นเมื่อ 2012-11-18. ↑ Garcia, Cathy Rose A. (5 June 2009). "Jun Ji-hyun Shines but Blood Disappoints". The Korea Times. สืบค้นเมื่อ 2012-11-18. ↑ Frater, Patrick (22 May 2007). "Korean star reborn in Blood: Jun Ji-hyun changes name". Variety. สืบค้นเมื่อ 2012-11-18. ↑ Mike, Fury (22 January 2010). "Interview with Gianna Jun – Jade Screen". MikeFury.net. สืบค้นเมื่อ 2012-11-18. ↑ Lee, Hyo-won (8 January 2008). "Jun, Hwang Become Super Heroes". The Korea Times. สืบค้นเมื่อ 2012-11-18. ↑ "Actress Jeon Ji-hyun Making Korean Comeback". The Chosun Ilbo. 28 September 2007. สืบค้นเมื่อ 2012-11-18. ↑ "Jun Ji-hyun Cast in Snow Flower". The Korea Times. 7 January 2010. สืบค้นเมื่อ 2012-11-18. ↑ "Jeon Ji-hyun to Star in Chinese Movie". The Chosun Ilbo. 5 February 2010. สืบค้นเมื่อ 2012-11-18. ↑ "Jun Ji-Hyun Interview at Cannes (By Dispatch)". Soompi. 23 May 2011. สืบค้นเมื่อ 2012-11-18. ↑ "Jeon Ji-hyun Narrates Hollywood Trailer". The Chosun Ilbo. 28 March 2011. สืบค้นเมื่อ 2012-11-18. ↑ "Jeon Ji-hyun to feature in July Issue of Vogue". The Chosun Ilbo. 28 March 2011. สืบค้นเมื่อ 2012-11-18. ↑ Powers, John (28 June 2011). "Eastern Promise: Gianna Jun and Li Bing Bing". Vogue. สืบค้นเมื่อ 2012-11-18. ↑ Lee, Jin-ho (13 June 2012). "Jun Ji Hyun Talks about Kissing with Kim Soo Hyun for The Thieves". enewsWorld. สืบค้นเมื่อ 2012-11-18. ↑ Hong, Grace Danbi (5 July 2012). "Jun Ji Hyun is Just Getting Started as an Actress". enewsWorld. สืบค้นเมื่อ 2012-11-18. ↑ "'The Thieves' Jun Ji Hyun, "A Competition With Kim Hye Soo? I Can't Even Compete With Her Breasts."". Korea Portal. 11 July 2012. สืบค้นเมื่อ 2012-11-18. ↑ Lee, Hye-ji (11 July 2012). "Jun Ji-hyun "The success of My Sassy Girl gave me both light and shadow"". 10Asia. สืบค้นเมื่อ 2012-11-18. ↑ Lee, Jin-ho (15 July 2012). 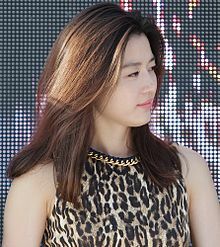 "Star Dictionary 2.0: Jun Ji Hyun, "My Sassy Girl Was A Sweet Disaster". enewsWorld. สืบค้นเมื่อ 2012-11-18. ↑ "Jeon Ji-hyeon satisfied with her role in new movie". The Korea Herald. 23 July 2012. สืบค้นเมื่อ 2012-11-18. ↑ Lee, Jin-ho (22 July 2012). "Interview: Jun Ji Hyun Invites Everyone Into Her Veil of Secrecy". enewsWorld. สืบค้นเมื่อ 2012-11-18. ↑ "Jeon Ji-hyun Gets Back into Groove with The Thieves". The Chosun Ilbo. 4 August 2012. สืบค้นเมื่อ 2012-11-18. ↑ "The Thieves Emerges as Most Popular Korean Movie". The Chosun Ilbo. 4 October 2012. สืบค้นเมื่อ 2012-11-18. ↑ Sunwoo, Carla (5 January 2013). "Jun Ji-hyun injured in action scene". Korea JoongAng Daily. สืบค้นเมื่อ 2013-01-09. ↑ Oh, Mi-jung (9 January 2013). "Jun Ji Hyun Says She Had to Pretend She was Awkward in Action Scenes for The Berlin File". enewsWorld. สืบค้นเมื่อ 2013-01-09. ↑ Lee, Jin-ho (3 February 2013). "Interview: Jun Ji Hyun Says She's Become More Confident Following Her Marriage". enewsWorld. สืบค้นเมื่อ 2013-02-04. ↑ Jeong, Ji-won (7 February 2013). "Jun Ji-hyun starts anew". Korea JoongAng Daily. สืบค้นเมื่อ 2013-02-07. ↑ Bae, Ji-sook (17 December 2013). "Gianna Jun proves aging is good: Actress to return to small screen with Kim Soo-hyun on My Love from the Star". The Korea Herald. สืบค้นเมื่อ 2014-01-08. ↑ Won, Ho-yeon (26 December 2013). "Jun Ji-hyun back on TV, sassier, flashier than ever". Korea JoongAng Daily. สืบค้นเมื่อ 2014-01-08. ↑ Chung, Ah-young (2 March 2014). "My Love sparks hallyu sensation". The Korea Times. สืบค้นเมื่อ 2014-03-04. ↑ Chung, Joo-won (27 May 2014). "Song Gang-ho, Jun Ji-hyun get top nods at Baeksang Awards". The Korea Herald. สืบค้นเมื่อ 2014-05-28. ↑ Hong, Grace Danbi (28 May 2014). "Jun Ji Hyun and Song Kang Ho Receive Highest Honors at the Baeksang Arts Awards". enewsWorld. สืบค้นเมื่อ 2014-05-28. ↑ Jeon, Su-mi (28 May 2014). "Jun Ji Hyun Sends a Love Call to Kim Soo Hyun". enewsWorld. สืบค้นเมื่อ 2014-05-28. ↑ Sunwoo, Carla (29 May 2014). "My Love stars sweep Baeksang Arts Awards". Korea JoongAng Daily. สืบค้นเมื่อ 2014-05-29. ↑ ""คิมกูรา" บ่นเบื่อการแสดงของ "จวนจีฮุน"". สยามดารา. 20 มกราคม 2557. สืบค้นเมื่อ 6 ตุลาคม 2557. ↑ Sunwoo, Carla (23 March 2012). "Designer talks about actress granddaughter-in-law Jun Ji-hyun". Korea JoongAng Daily. สืบค้นเมื่อ 2012-11-18. ↑ Cho, Chung-un (13 April 2012). "Actress Jun Ji-hyun ties the knot". The Korea Herald. สืบค้นเมื่อ 2012-11-18. ↑ Kwon, Mee-yoo (13 April 2012). "Actress Jun ties knot with designer's grandson". The Korea Times. สืบค้นเมื่อ 2012-11-18. ↑ "Today's Photo: April 14, 2012". The Chosun Ilbo. 14 April 2012. สืบค้นเมื่อ 2012-11-18. ↑ Lee, Jin-ho (14 April 2012). "Jun Ji Hyun Ties Knot With Banker". enewsWorld. สืบค้นเมื่อ 2012-11-18. ↑ Han, Ah-yeong (14 April 2012). "Jun Jihyun reveals her love story and propose". StarN News. สืบค้นเมื่อ 2012-12-26. ↑ "Jeon Ji Hyun marries Choi Jun Hyuk in lavish ceremony". Channel NewsAsia. 16 April 2012. สืบค้นเมื่อ 2012-11-18. ↑ Sunwoo, Carla (20 April 2012). "Jun Ji-hyun to star in wedding pictorial for Elle Asia". Korea JoongAng Daily. สืบค้นเมื่อ 2012-11-18. ↑ "จอนจีฮยอน (Jeon Ji Hyun) เผย "ชอบทำอาหาร มักทำอาหารเกาหลีกินเองบ่อยๆ"". popcornfor2.com. 12 มีนาคม พ.ศ. 2557. สืบค้นเมื่อ 6 ตุลาคม 2557. ↑ "Assassination หนังใหม่ยัยตัวร้าย! "จอนจีฮยอน" ร่วมภารกิจลอบสังหาร". ASTV ผู้จัดการออนไลน์. 12 กันยายน พ.ศ. 2557. สืบค้นเมื่อ 5 ตุลาคม 2557. หน้านี้แก้ไขล่าสุดเมื่อวันที่ 5 ธันวาคม 2561 เวลา 13:29 น.